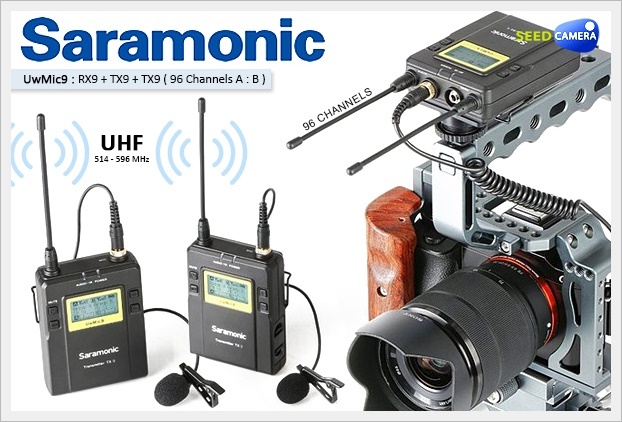 The Saramonic RX9+TX9+TX9 UHF Wireless Lavalier Microphone System provides stable, interference free audio in portable, compact and low cost package. This system is a perfect fit for DSLR videography, field recording and interviews, broadcast TV, ENG, providing dependable audio broadcasting and recording. The Saramonic UwMic9-RX9 is a camera-mountable integrated wireless receiver. It features a wide switching RF bandwidth, an easy-to-read LCD display and infrared synchronization between transmitter and receiver. Equipped with an auto-scan function, the RX9 can automatically search for an available transmission frequency. The headphone jack enables real-time monitoring or the receiver via headphones, especially useful for cameras that lack a monitor output.